A terrible plague has decimated the world, and those who were unfortunate enough to survive have been transformed into blood-thirsty creatures of the night. Except, that is, for Robert Neville. He alone appears to be immune to this disease, but the grim irony is that now he is the outsider. He is the legendary monster who must be destroyed because he is different from everyone else. I find I Am Legend hard to review or comment on, which was interesting because I read it for book club. This is the second time I have read it though and I did plan on reading it again, but always put it off because I loved it the first time around and what if I didn’t love it as much the second time around? My way of reading has changed a great deal since I first read it, only a few years now, in that I have more of a tendency to critique rather than enjoy. It turns out I do have some things to critique with I Am Legend, but hardly any at all. The only things I could see that could be edited are typical things writers of all types, and really any human that speaks, do all the time. Repeating words too often. That’s it. Apart from that, I still have a hard time commenting on I Am Legend. It’s one of those books that leave me in a mood. Not necessarily a bad mood, but a contemplative mood. Some books just do that with their content. I do really enjoy the setting of the story, the characterisation and growth, I love the scientific approach to vampirism, but it’s the underlying messages and meanings that always truly get me. I feel those are what ultimately make the story. Sure all the other aspects of it that I mentioned, the dressings so to speak, help pull me in, but it’s the underlying aspects of it that keep me there and they keep me thinking of this story for days, weeks, months, and now years afterwards. It’s a novella that I tell people to read and it’s also a novella that coincides with me feeling the need to throw my arms up in exasperation from when people tell me they’ve seen the movie and not read the book. So many people are missing out by disregarding the book after seeing the movie. So much is changed, so much is missed out on, and so many points are lost through the movie of the same name (I Am Legend has been adapted to three movies – The Last Man On Earth, The Omega Man, and I Am Legend). This is always where my opinions and comments on the novel end up and it’s not really something to delve in to so I recommend reading the book if you haven’t done so and yet seen the movie. Besides the fact that the story is set in the 1970’s and yet written in the 1950’s (I love it when writer’s do that, such as 1984), another thing I love about I Am Legend is even though it presents itself as a horror story it is more of an intellectual horror story. I don’t want to say that and put people off because of it, it still is a horror story of sorts, but it’s not about all the gore and frights that so many people attribute to horror. It’s about so much more, even the crushing sense of loneliness can be a horror in itself, and that’s only one part of it. That’s something else that makes me fall in love with this story each and every time. It isn’t about anything particularly pleasant, it does question internally and socially, it’s not about what happy things can come of tragedy. 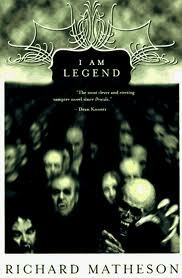 To me I Am Legend, albeit a vampire story, has far more realism in it than a lot of other stories out there. Reminds Me Of: If I said it would spoil it. I haven’t seen all of them yet! So far it’s only been I Am Legend. I do have the other two on my list and have been attempting to watch them for several years now, but it’s always either a case of not available at the video store or not available to buy when I go to purchase DvDs. Did you find The Last Man on Earth to be truer to the story? I *loved* this review and hope to read the book soon. I really like what you said about it getting you into a contemplative mood and how it is a “thinking” horror book and how loneliness can be a horror in itself. Fear is different for every person. It’s great because of that, that it’s not constant action like so many books have today. I think stories like that can really make you appreciate the art of story telling. I’ve only seen the first two movies. I do not like Will Smith. I like both movies, which is not a popular thing to say, I know. I also like the book. It certainly works as a horror story, but you’re right about it also working on an intellectual level. I think the ending of the book is very thought provoking, much more so than either of the two movies I saw. I haven’t seen the first two movies so you’re ahead of me there. I’ve heard good things about the first two though and haven’t come across any sort of consensus that they aren’t liked. That’s actually the first I’ve heard it. It doesn’t surprise me that the ending is different in both the movies compared to the book. I guess they’ll always change it to be more Hollywood, but it would be nice to have a film adapted with the actual ending. Oh, and I enjoyed the Will Smith film except for the ending. It’s not that bad, it’s just too different. Well, you are bound to be exasperated yet again. I am one who saw the movie of the same name, starring Will Smith. I didn’t know it was based on a book but now I must find a copy. Is it still in print? I am assuming so if it was a bookclub read. Hi Shirley. It doesn’t surprise when someone didn’t know that the movie is based on a book, more so when someone knows and yet rights it off because of the film and it happens a lot. It’s still in print and pretty easy to get. You might even find it at your local library.